My God....its been ages since I posted something on my blog. I thought it will be a breeze coming to India, visiting friends and family, attending ceremonies, celebrating festivals, voting for our state elections, managing my naughty two and a half year old and browsing my blogging friends yummy recipes.... I was so wrong . I don't know when the day begins and when it ends..... it is hectic to the core. Thank God for yesterday's heavy downpour preceeded by quite a gush of swift wind.... It was such a refreshing change from the scorching sun and heat. Now coming to the recipe... this is one of the most simplest of cakes and that too with the "Universal Favourite Ingredient - Chocolate". The basic cake recipe is easy but the icing can be done in various flavours according to your own taste. One of my personal favourite flavour is "mint" and that is what I have combined with chocolate in this recipe. Not to mention the lovely green colour and refreshing flavour that contrasts and compliments chocolate brown colour and flavour. You can play around with the icing colours and flavours according to your taste- banana or pineapple flavouring with yellow colour, strawberry flavour with pink colour, coffee flavour with brown colour , chocolate icing , plain cream icing topped with fresh fruits or ready made decorations .... the options are endless ..... just have fun. Self raising flour: 125 gms. Green food colouring: 1 tsp. Dark chocolate drops: a handful. 1.Heat oven to 190 degrees C/ 170 degrees F/ 375 F/Gas mark 5. Grease and line the base of two 20 cms cake tins. 2.Beat the butter and caster sugar until pale and fluffy. 3.Add the eggs, one at a time, beating for a couple of minutes in between each addition. 4.Sift together flour and cocoa powder. Fold into the egg mix along with the vanilla essence. 5.Divide the mix equally in between the two cake tins and smoothen the surface. 6.Bake in the middle rack for 20 mins until well risen and the surface is firm to touch. 7.Remove from the oven and cool in the tins for 5 minutes. Turn onto a wire rack to cool off completely. 8.Beat the double cream to whipped cream consistency. Add the condensed milk, mint extact and green food colouring and mix well. 9.Smear half of the icing cream on top of one cake and place the other cake on top of the first one. 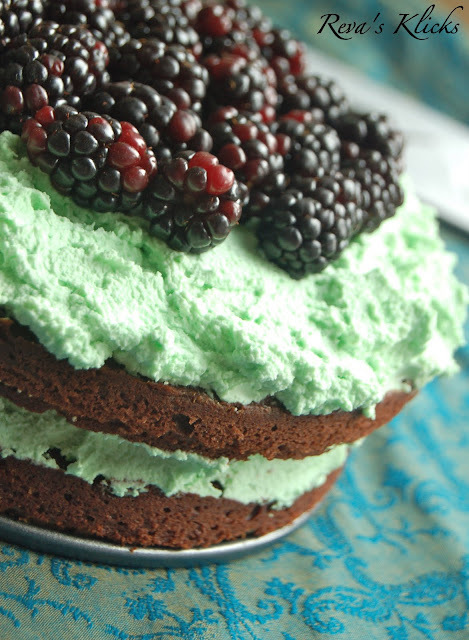 10.Apply the rest of the cream on top of the second cake and arrange the blackberries on top. 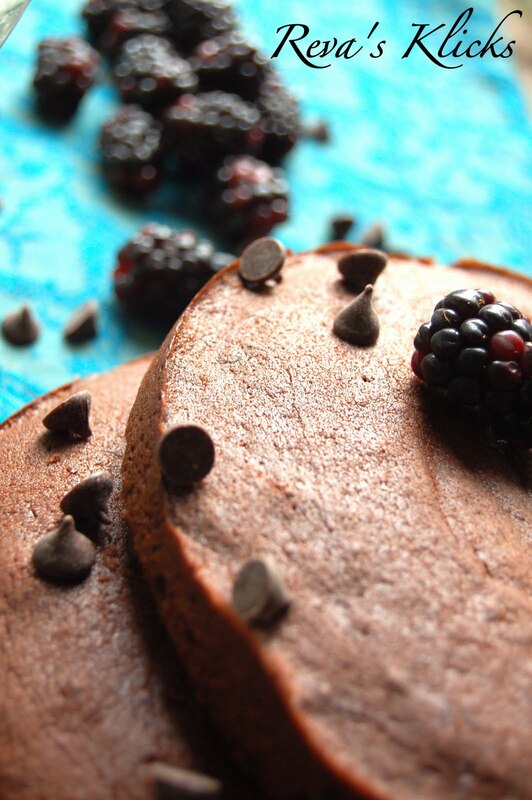 11.Melt the chocolate drops and drizzle on top of the berries. Note: This is best eaten on the day of preparation. If you are planning to make the cake in the morning and serve in the evening - make the cake,store them in air tight container, ice and decorate an hour before serving. u were right when u talked about colors.. it is so refreshing.. honestly, i have never tasted mint on cake.. interesting twist.. presentation is sky rocketing ! wow perfectly baked cake !! looks so inviting !! Hey Reva, glad you are having a great visit home, though we did miss your presence here :) That cake looks absolutely gorgeous, esp with the chocolaty mint flavors. Yummy!! Thats sounds heavenly and your cake looks so perfect..great photos too! 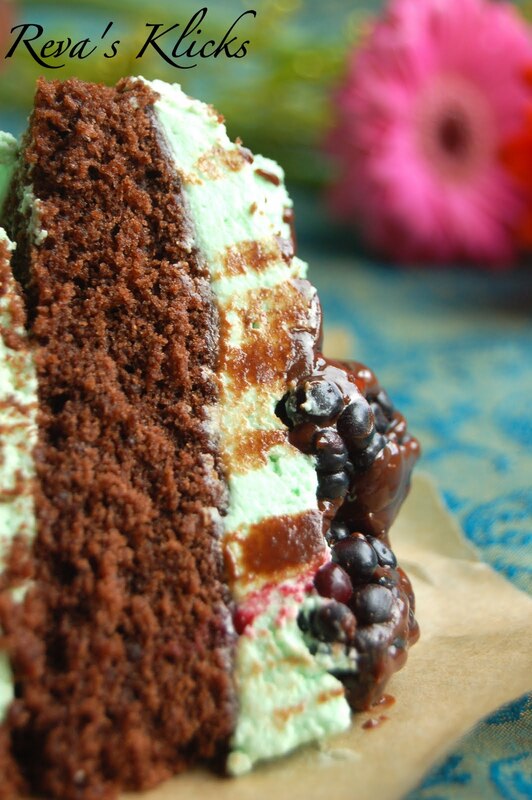 I dont bother to have a slice of this gorgeous looking cake, havent tried mint frosting yet, sounds wonderful..
OMG Chocolate n mint- Sounds total YUM :) I'll take that!! Looks gorgeously irresistible.. This looks mouthwatering!!! perfect recipe! Chocolate and mint cake sounds and looks heavenly. I love blackberries.... Chocolate cake - Super combination. the cake looks so delicious. soft and yummy. beautiful pics..
Gorgeous looking cake. Different combination of flavors....YUM! wow, this is awesome! so elegant and fluffy! Wow! Wonderful combination of mint and choclate.Reva! where we can get the berries in TamilNadu? The decoration is beautiful...mint frosting sounds so interesting..lovely clicks. How gorgeous and decadent the cake looks! Beautiful color and lovely frosting. கேக் ரொம்ப நல்லாயிருக்கு..புதினா எசன்ஸ் சேர்த்திருப்பது புதுசா இருக்கு.இனி அதையும் சேர்த்து செய்துடுவோம். Beautiful cake Reva.. My cousin who is 14 wanted to bake a cake for herself, but I didn't have a simple recipe she could use... This one looks easy and yummy!!! Bookmarking this ..
Wow so yummy cake..loved it. Wow! What an amazing looking cake! Looks fantastic ... perfect clicks! 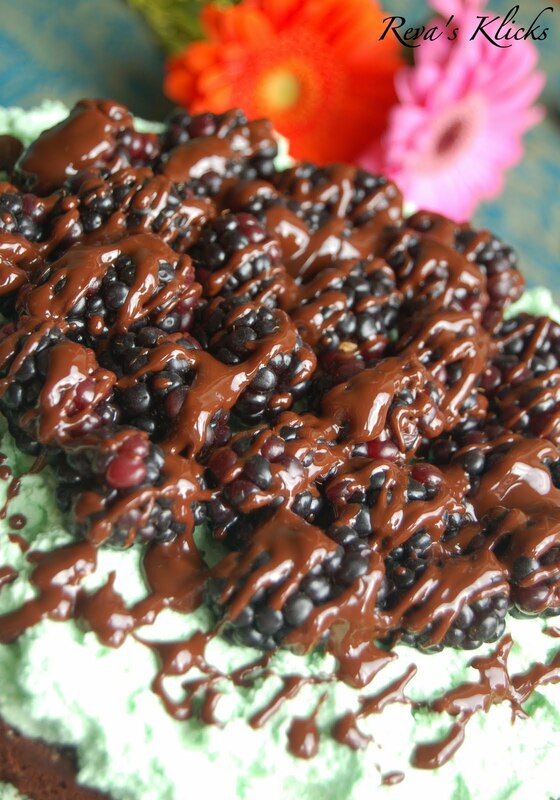 Wow, thats a beautiful creation, lovely toppings...mint and chocolate are my fav' ingredients. Awesome work. Sweety .. Thanks for visiting my space.. Fantastic and delicious cake,nice presentation.Thank u for stopping my space and leaving such lovely comments and I glad to follow u! Cake looks delicious. Lovely pictures .. drooling :) Thanks for stopping by my blog and you have a wonderful space here. Thanks for dropping by Reva...loved your blog and all the lovely bakes. Beautiful cake! Love the mint and choc combo! Wow,what visual treat.The cake looks so yummy and inviting.Great clicks. Lovely cake and the presentation too is so good.